No fantastical race hungers for gold and glory quite like the Dwarves. 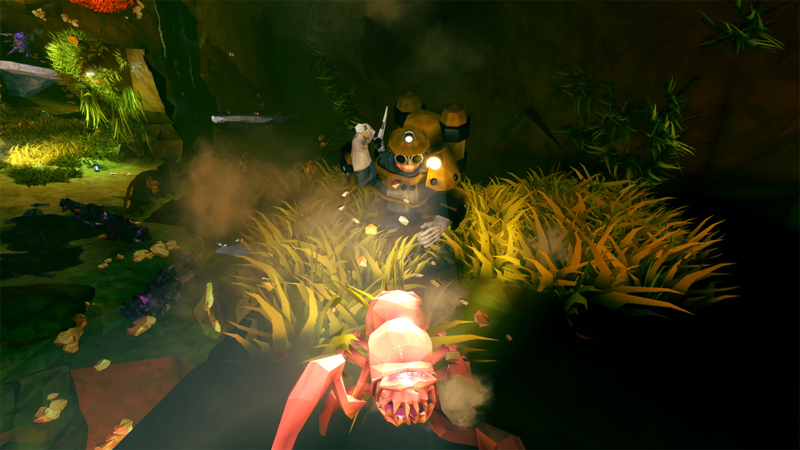 Miners of incredible skill, they seemed the natural choice as lead protagonists for Ghost Ship Games’ Deep Rock Galactic. 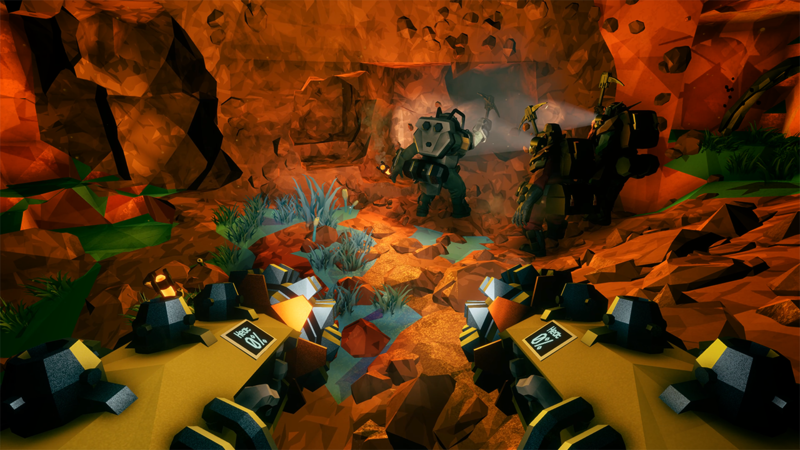 Strong, stubborn and downright tenacious, there’s no one else the Deep Rock Galactic Mining Company would rather count on for this treacherous mission to the mineral-rich planet of Hoxxes IV. 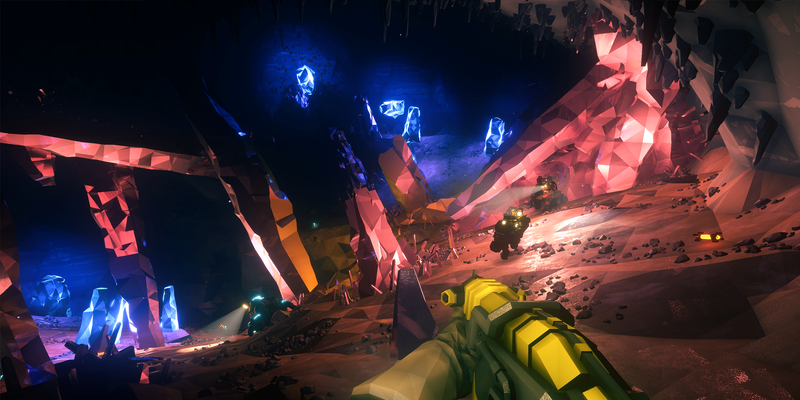 Part shooter, part space mining epic and all co-op, Deep Rock Galactic is a colorfully animated adventure fully dependent on the stark contrasts between light and dark, brought to life by Unreal Engine 4. Sporting a minimalist yet highly stylized polygon aesthetic it stands out among its compatriots as something truly unique. Working as a team, four players quest for nothing more than riches and survival… no matter the cost. Brought together by fate, six friends co-founded Ghost Ship Games and pegged Unreal Engine 4 as the natural choice for Deep Rock Galactic. We speak with three of the studio’s co-founders (Søren Lundgaard - CEO, Jonas Møller - Lead Programmer, and Robert Friis - Art Director) who tell us that despite using many different engines over the years, the suite of tools and ease of use for UE4 just made sense. Launching into Early Access on Feb. 28, 2018, on both PC and Xbox One, we get an inside look at what it took to bring these gun-toting dwarves to life. You all have a solid development background on other projects. What brought you together? Robert Friis - Basically, it was a shared passion and a unique opportunity that was handed to us. Five out of our six founders had worked together for years and were laid off at the same time. Once the idea was first raised, everyone was pretty much on board right away - now or never, you know? It’s been hard work, but I think I speak for all of us when I say none of us have regretted it for a single second. Tell us a little bit about why co-op gaming is so important to Ghost Ship Games. Robert Friis - It’s just a genre we’re all really big fans of, with the added benefit of still being fairly unspoiled territory too. There’s a bunch of co-op games out there already, but at the same time, the genre remains fresh. That gives us a lot of freedom to experiment without compromising any player preconceptions too badly, and we really like the idea of that. 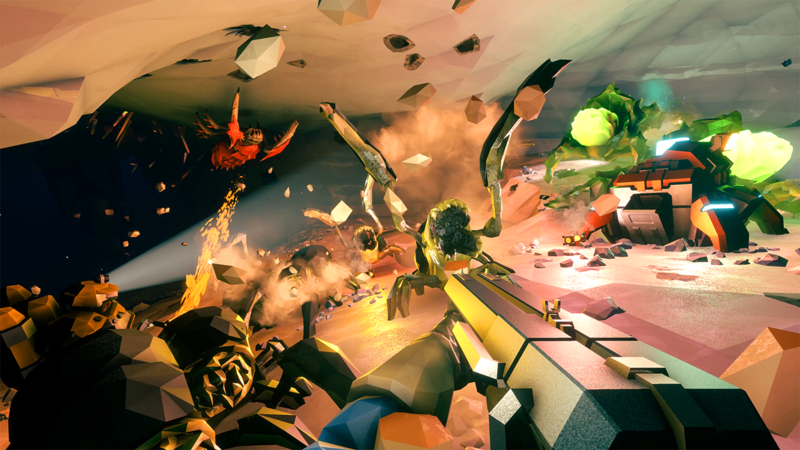 We can make “our own thing”, even if it also contains aspects of a conventional shooter. What was the inspiration behind making Deep Rock Galactic your first title as a studio? Søren Lundgaard - The idea for Deep Rock Galactic is essentially what formed the studio. I analyzed the concept with the other founders, and we realized the idea had a lot of things we could capitalize on. It was a sandboxy kind of game that would work well with our intentions of open development and Early Access. It had technology at its core too, which fit our very tech-inclined founder group well. And the co-op aspect with space mining Dwarves turned out to be something that was surprisingly easy to pitch to both publishers, investors, and gamers. 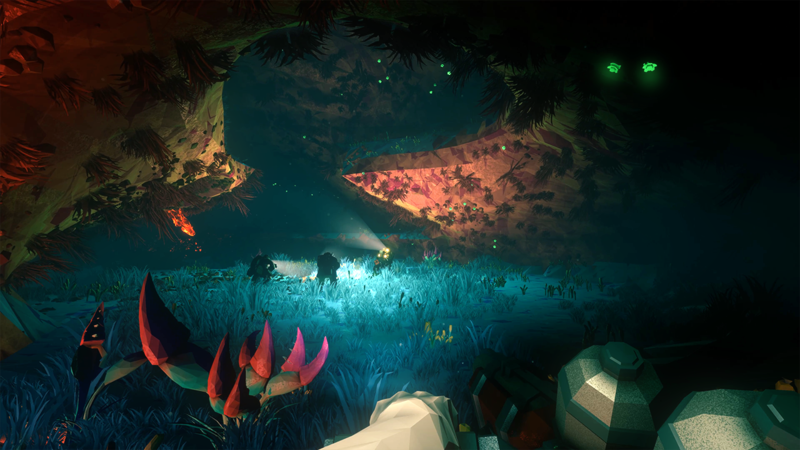 Deep Rock Galactic will very likely be the only title for us for some time. You don't see many games that have Dwarves with gun! How did that idea develop? Any particular games you can call back to for inspiration? Robert Friis - While “Dwarves in space” is not a new trope, it’s definitely one that’s not been explored as much as it deserves. For most of us, the inspiration is probably old school Warhammer 40,000 as far as the Dwarves go, alongside a slew of our all-time favorite movies - Aliens and The Abyss are two huge inspirations behind the overall mindset and mix of horror and humor for the game. The polygon graphics look absolutely stellar in action. Did you know you wanted this style from the onset or did the style change during the development process? Robert Friis - It was initially born out of a technical limitation in the way we generate our caves - no smooth surfaces. But in time, it became pretty clear to us that the style also fit the game really well. We experimented with more detailed, fully normal mapped models, but given the size of our team and the scope of content we’re envisioning, going lower detail makes a whole lot of sense. We’d rather have ten types of stylized monsters than one really high-def one. 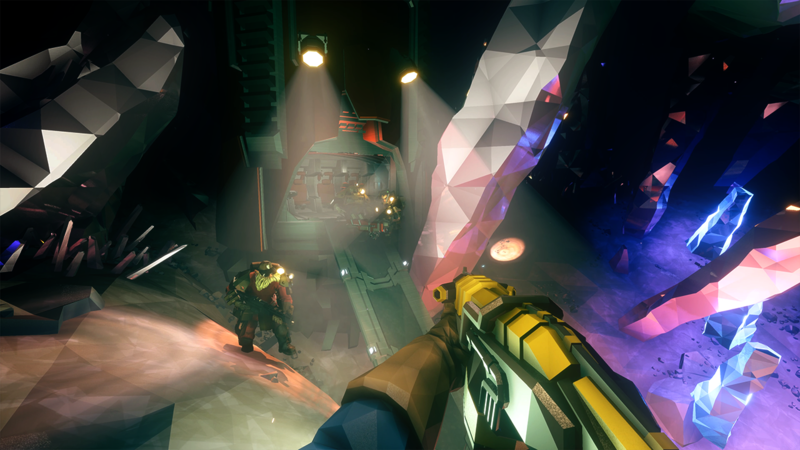 What can you tell us about the co-op aspects of Deep Rock Galactic? Does each individual player take on a specific role or is it a Dwarven gun-fare free-for-all? Robert Friis - We like to say it’s both, actually! Each player takes on the role of a specific class, so one will be The One With The Gatling Gun, while another will be The One With The Big Drills, and so forth. We have four classes in so far and are already planning more to add further down the line. That said, once the proverbial doo-doo hits the fan, it’s more or less a free-for-all... we’re quite proud of how hectic the combat has gotten without being too overwhelming. Speaking of guns, can you tell us about the weapons and tactics that players will have at their disposal? How does mining fit into the gameplay? Robert Friis - We’re going for a very wide spread of skills and gear among the classes, and are therefore more or less forcing co-op opportunities. For instance, while one class can fire a zipline from one point to another, it’s another class that can then put up a platform to land on underneath. We’re going for a strong synergy between the different classes, giving everyone the tools to succeed, but at the same time fostering the feeling that everyone is an integral part of the team. That’s been a very important part of how we go about it from day one. As for the mining itself, it plays a very big part too. The Dwarves themselves are miners first and foremost, and they have a job to do. While they’ll definitely be kept busy by dozens and dozens of alien creatures flinging themselves at them, it’s the gold, the MORKITE, all the riches of Hoxxes, that they’re actually there for. Get in, get the goods, and get out alive. That’s the Deep Rock Galactic way. 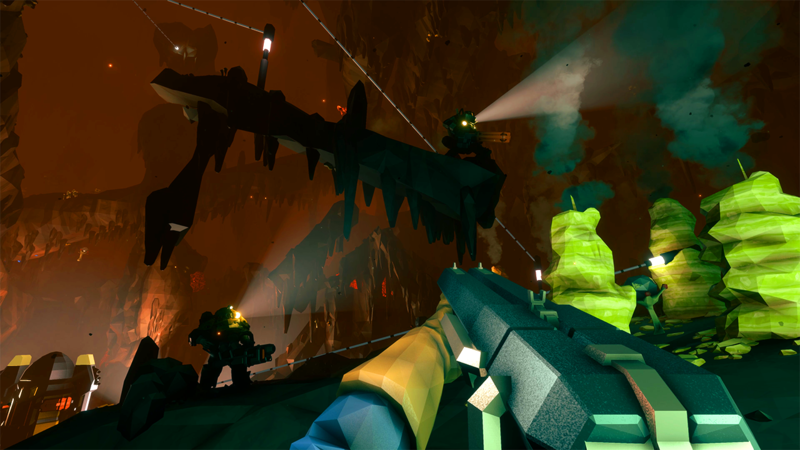 The lighting in Deep Rock Galactic is of particular notice. How did Unreal Engine help you bring such an important aspect of the game to life? Robert Friis - Since all our levels are procedurally generated, we’re unable to utilize the baked lighting you tend to see in most games. That means we needed a really, really powerful and flexible engine that would be able to handle it all in real-time without bringing the entire house down with it. Unreal Engine has been truly great to work with in that regard - while it’s not the only engine out there with the grunt to handle what we’re demanding of it, the simplicity of setting up a working prototype and having something on screen in minutes has saved us countless weeks of work so far. Considering your backgrounds with big publishers such as Ubisoft, you're likely no strangers to Unreal Engine. How has that experience changed now that you're operating independently at a smaller studio? Jonas Møller - We actually didn’t have a lot of Unreal Engine experience before starting on our own, but of course we have a wide range of experience with a lot of different engines spread over the team. The biggest difference is that we have to be able to do everything ourselves: packaging, localization, user stats, etc. It really helps that Unreal is comparatively well documented and that there is a big and active community. The other thing is just the pure development speed that comes from being so small and focused. Unreal Engine has a really solid foundation and this helped us jumpstart development so that we actually had the basic experience up and running within the first month. You've had alpha and beta runs with your community leading up to release. How has community feedback helped to shape the game? Robert Friis - The community and the feedback we’ve gotten from them has just been awesome. An enormous motivator, and a bunch of really cool ideas. Many of the ideas we’d already thought of ourselves beforehand, but that just makes it doubly awesome to see people want the same things we do. And once we got the closed alpha up and running it was just fantastic, seeing this wave of passion just roaring towards us, full of ideas, good points, streams… can’t wait to see what Early Access is going to bring. Are there any aspects or tools of Unreal Engine that have proven particularly useful in development? Do you have a favorite? Jonas Møller - I think the width and high baseline quality of all the tools in the engine are what really sets it apart from anything else we have worked with and everyone on the team probably has a personal favorite, but I think the Blueprints / Asset system is what really allows for rapid prototyping and development. UI Development, while still complex, is also much better than anything we have tried before. Where can people go for more information on Deep Rock Galactic? The easiest is to visit our landing page at www.deeprockgalactic.com. Here, you can find links to the Steam Store and the Microsoft Store. From the 28th of February, it will be available on Steam, Xbox, and Win10.